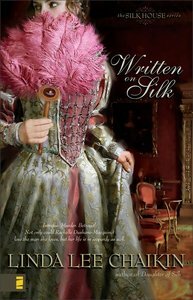 About "Written on Silk (Silk House Series)"
A royal wedding masks the unfolding of Catherine de Medici's murderous plot against the Huguenots. Will any of the Huguenot princes survive? Life and death rest with two people … Rachelle Dushane-Macquinet, couturiere from a celebrated silk-making family, has come back to the Louvre Palais to create the royal wedding gown. Recruited into the evil Queen Mother's ring of women spies, she must use her wits to preserve her honor-and the lives of her fellow Huguenots. Marquis Fabien de Vendome has also returned from a buccaneering venture against Spain. The Queen Mother plans to implicate him in an assassination. But Fabien has designs of his own. A man and a woman caught up in history's deadly swirl and love's uncertainties seek to escape the venom of Madame le Serpent. Faith in Christ must uphold them, and all who stand alone, in a city gone diabolically mad.